Put Your Worries Aside With This Cool Quick Guide! Do you worry about things that haven’t happened yet? Do you worry about something bad happening? Does worrying cause more worry? Did you know that most worrying is about things out of your control. This pointless worrying accounts for up to 85% of your worrying thoughts. Left unchecked persistent worry can cause you stress, anxiety, depression, fear and have major negative impacts on your life. 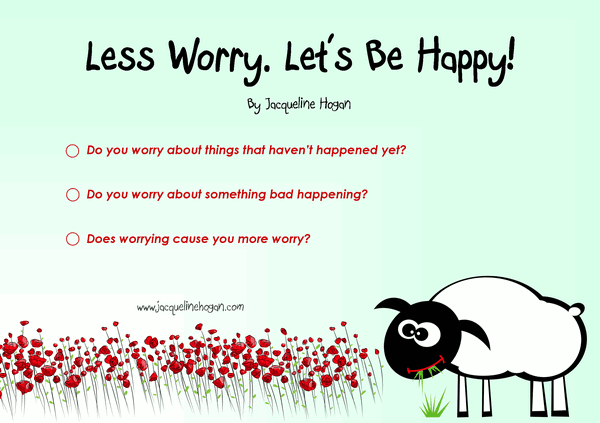 My new mini ebook “Less Worry, Let’s Be Happy” gives you easy-to-use strategies and helpful insights to use straight away. Lower your level of worrying and make room for happiness and calm in your life. Based on the latest research, neuro science and “what works” – You will break free from habitual thought and behaviour patterns holding you back. Download the Ebook & Worry Less! Download the free PDF now. But be quick before it goes into the members area!